When the Marine Corps acknowledged last month that it would begin using U.S. tanks in the war in Afghanistan for the first time, one of the most obvious questions was simple: Where? We’re starting to clear that up. The Corps has released several photos recently that show that elements of at least two platoons from Delta Company, First Tank Battalion, out of Twentynine Palms, Calif., have joined Battalion Landing Team 3rd Battalion, 8th Marines. The ground combat element for the 26th Marine Expeditionary Unit, 3/8 was called off Navy ships last month to lock down the upper Gereshk Valley, an area of Helmand province between volatile Sangin district and Lashkar Gah, the provincial capital. Details are scant, but Mills made it clear the Gereshk Valley is a priority in the shortterm. In the interview I mentioned here, he described it as one of the hotter spots Marines have operated in recently. UPDATE: Marine Corps Times colleague Gidget Fuentes sat in today on a roundtable discussion in San Diego with Mills, who briefed from Afghanistan. 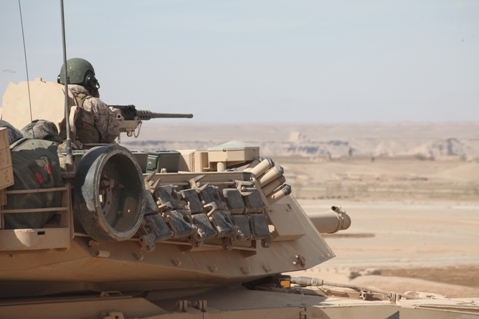 Mills said tank crews have fired the main guns on the M1A1 Abrams “more than once against enemy IED emplacers at long range.” As of Feb. 16, three tanks had struck IEDs. Two were left unscathed, and the third sustained damage to its tracks, which crews repaired a few hours later, he said. Roll in deep tanks. So jealous, but so happy have fun and get some Tanks! i was with 3/8 in afghanistan back in 2008-09 i was attached to them as a route clearance operator thats a great group of guys best of luck!! !